Mark your calendars! Hank the Cowdog musical coming to Tulsa, OK this summer! 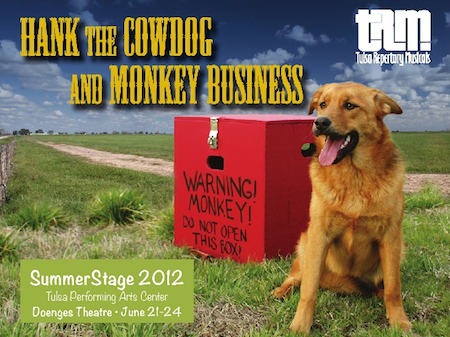 June 21-24, 2012: "Hank the Cowdog and Monkey Business," presented by Tulsa Repertory Musicals. Adapted by Rogers State University professor David Blakely from the popular series of children's books by John Erickson. The musical will be performed in the Doenges Theatre in Tulsa, Oklahoma. "Hank the Cowdog and Monkey Business runs June 21-24 with matinees at 3 pm and evening opportunities at 7:30 pm. Tickets are $18 for adults and $8 for children and can be purchased by calling the Tulsa Performing Arts Center Ticket Office (918) 596-7111 or online at MyTicketOffice.com." News release in "Tulsa World"
Official website for the company performing the musical, "Tulsa Repertory Musicals"